Superfast Broadband via Fibre-to-the-Property (FTP) has been live in Elkstone for nearly 3 years now, and the ‘teething’ stages are long gone, so anyone who has not yet enrolled for service can do so with confidence. There are many “best fibre provider in your area” search sites that suggest that FTP in this area is not available, this is not the case – the reason they say it’s not available is that they only poll the availability of Fibre to the local British Telecom telephone exchange (Coberley), which has no fibre connection. For whatever reason, they do not include direct connection providers such as GigaClear who put all the necessary underground infrastructure to get Fibre to all properties in the village. Connection subscriptions currently offered by GigaClear are 30, 300, and 900 Mbps. The Fibre-to-the-Property technology is very reliable, but do note that these speeds are achieved at the router under ‘ideal’ conditions, specifically where only one PC is connected via cable directly to the router, and that no other device is connected to it. Bear in mind also that testing via WiFi is completely unrealistic as the data transfer rate is necessarily slowed down by wireless encryption / decryption and also by signal reduction through walls etc which can give a significantly lower speed indication than is really the case – so don’t become agitated if your smart phone reports a lower speed, it’s almost certainly working at its maximum! Suffice to say that the available range of speed choices for this service can ensure that the needs of every household from occasional email users up to several quite serious game players are easily accommodated. As mentioned above, BT do not provide Superfast speeds through telephone land-lines, it is still copper to the local cabinet, so expect 4 – 8 Mbps through an ADSL router, depending how far you are from it. The cabinet is situated at the north end of the village, just at the top of Bubbs Hill. If you want to enroll for superfast broadband, simply click The Gigaclear Postcode Checker page. Enter your postcode, and a drop-down list of properties appears – pick your own, and follow the screens and prompts to order your service, set up connection and payment arrangements etc. Note that subscriptions are available from Gigaclear directly, or through a number of different retail providers, whose tariffs may suit your requirements better. As each connection is activated, an email will be sent to the subscriber using the address provided on the enrollment page. Below are some FAQ answers to the more common questions arising (just click on the + sign to see the answers) and there’s an online form at the foot of the page so that you can submit further queries and comments. What are Gigaclear Routers like? Can I extend or boost my Wi-Fi signal around my property? You can extend or boost your Wi-Fi in your property using a wireless repeater or access point. Depending on the specification, these can be purchased online for around £40 to £80. There are 2 primary types of Wi-Fi extender. A signal booster amplifies and extends the footprint of the existing signal and is generally installed half way between the router and where the devices are needed to be used. 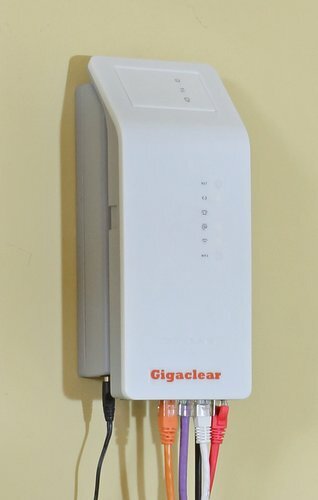 The second type is a wireless access point either connected using a LAN cable to the Gigaclear router, or is a power line extender which requires 2 units, one plugged into a mains socket adjacent to the router and connected to the router using a LAN/Ethernet cable, the other unit is plugged into a socket on the same ring main in another room, where the device is needed to be used. Does IP Telephony such as Vonage work if there is a power cut? Yes, but it is it is necessary to have your key network components (Router with VOIP phone connected) powered by an uninterruptible power supply or UPS. This is essentially a ‘shoebox’ sized unit containing a battery that is normally on trickle charge, and when all is normal, devices plugged into it derive their power from the mains. When a power failure occurs, clever circuits within the UPS draw current from the battery, and generate 240 Volts AC to replace the failed supply. The mains change-over is so fast that the connected devices do not glitch at all; when the normal power is restored, the devices are switched back to their normal mains supply. This approach costs about £120 – 150 to purchase – various makes of UPS are around, just key “Uninterruptible Power Supply” into your preferred search engine, and a variety of models / suppliers shows up. Don’t be tempted to buy long endurance systems costing quite a lot more – the maximum time that Gigaclear’s cabinet(s) can operate (from their UPS’s) is about 4 hours before they shut down; over the past 7-8 years there have been mains shut-off’s in Elkstone, but only one lasting more than this time. Is there a choice of IP Telephony Provider? Yes, there are many, though Gigaclear sponsor Vonage as a marketing collaboration. Again, key IP Telephony into your browser quite a large number of providers’ websites will show up so that you can choose the tariff that suits you best.